Readers of this blog know that I’m a huge fan of homeopathy. For me it has been a godsend for treating chronic complaints, and for keeping my kids well away from overuse of antibiotics and steroids . I have always dabbled in homeopathy, I choose the hospital where I had my boys partly because they administered homeopathy pills before anything more conventional, but I wasn’t really familiar with it and I wasn’t a fan. That all changed when my little boy’s immune system was at an all time low and I was desperate for help. He picked up absolutely every bug going at nursery and from everywhere else for that matter. Every Friday night, without fail, he would come down with something and I don’t think he was ever in nursery on a Monday! Conventional medicine offered antibiotics in truckloads, and steroid creams for his eczema. We did try the steroids cream when he was really bad, but it only got slightly better when applied and went straight back square one when we stopped it. I was not prepared to give my sensitive boy that medicine on a daily basis and that Friday feeling we used to have, well let’s say that wasn’t really happening …. I decided to have him assessed by a homeopath. She did an extremely thorough investigation, I was told not to expect miracles overnight- that it might take awhile to find the right remedies for him. I was utterly astonished when after only 10 days we saw an enormous difference, no more Friday- Monday illnesses, I could not belive it! The transformation was so enormous I’ve been a huge, huge fan ever since. Homeopathy is based on the law of similars, meaning that a substance causing a disease can also cure it, some of these substances are of course toxic, but the remedy is prepared by diluting it and vigorously shaking it (potensiation). It’s so diluted it doesn’t contain a single molecule of the original substance, more like just the energy of it. I’m desperate to learn more about homeopathy and will hopefully do a course after I finish the nutrition course . What I do know is that it has worked wonders for my boy. Homeopathy bashing is big at the moment, especially here in the UK. Now here’s a thought, what if a drug could be diluted and shaken (potinized) and create billions of effective drugs, how amazing for all poor people in the world and how awful for the big drug companies, just saying. I don’t know why homeopathy is getting such bad press at the moment, maybe it’s getting too popular? In my 8 year-old’s school the matron hands out Arnica if the kids hurt themselves, and I hear of many GP’s “off the record” telling parents to go and see a homeopath for a chronic complaint. I love that the royal family here in the UK are such loyal supporters (my reason for being a royalist in this country, In Sweden I don’t see any point of a royal family). My 8 year-old suffers from hay fever and as soon as the spring term starts he get’s itchy eyes and a runny nose. 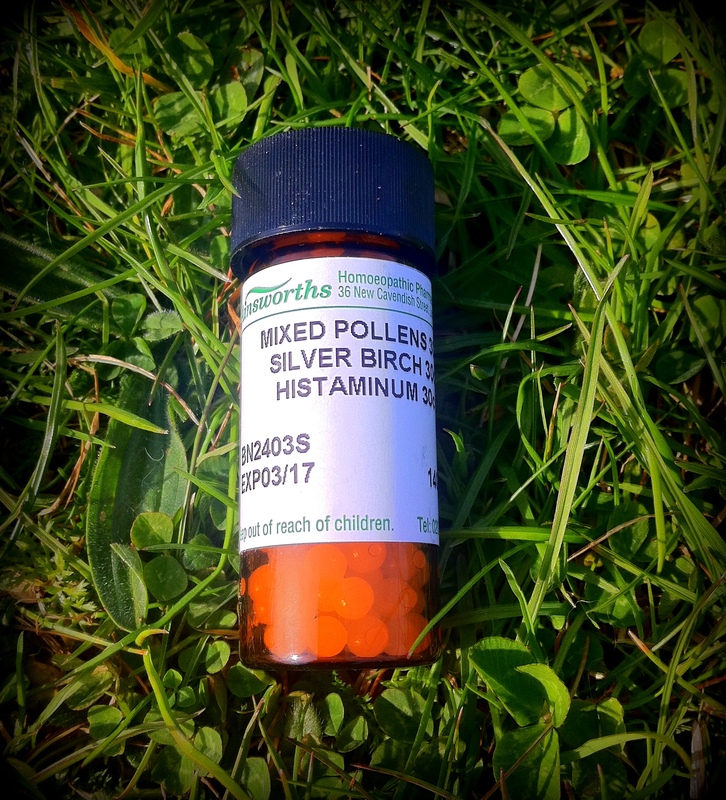 The combo in the above picture is working really well for him, its mixed pollen, silver birch and histaminum, all in one pill. Diet is of course also very important during the hay fever-season and I give him extra Omega 3, honey from organic local farm, elder flower cordial and sweet dandelion root tea., but the game changer is definitely the homeopathy pills he takes.